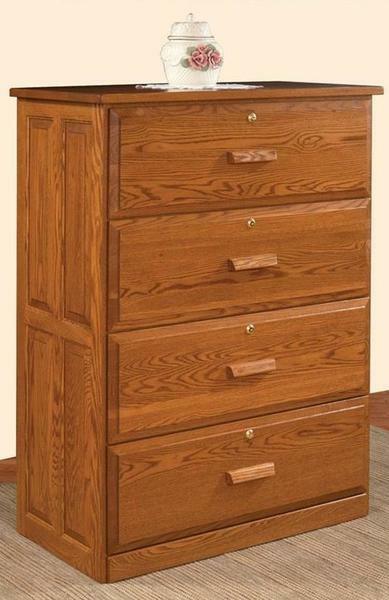 All of your file storage needs will be supplied by this 4-Drawer Lateral File Cabinet. It is designed to provide years of regular use along with an attractive appearance for an inviting office space. It is available in a variety of wood types and stain choices. It has dovetail drawers with full extension slides that have a weight capacity of 100 pounds. The drawer bottoms are solid oak plywood. The panel sides are raised. This piece is solid wood with a 1" thick frame. Both pieces were delivered on Monday, and I’m still finding myself staring at them both, marveling at how beautiful they are! The filing cabinet looks even better than it did on the website and fits in the space exactly as I had pictured it. I was a little apprehensive about the media cabinet, since it was built completely on my specifications – I was worried I hadn’t adequately described what I wanted. I should not have been concerned because it is stunning, and exactly what I was looking for. I had a carpenter come in this morning to bolt it to the wall; he was equally impressed with the quality of the workmanship and wanted to know where I had found it, so I happily showed him all 3 pieces I have purchased from you all in the last 1 ½ years! Thanks to you also for being so thorough and patient as we worked through the details on the media cabinet. I appreciate your attention to detail and willingness to work with me so that I could have exactly what I wanted. From my perspective, it was well worth it! You’ll definitely be the first place I turn next time I need furniture.